Maggie Nicols and Contradictions filmed oral history conducted as part of the Heritage Lottery Funded Music & Liberation project. Interviewed by Deborah Withers and filmed by Emma Thatcher. ‘My background includes that of dancer, guitarist, songwriter, and lead singer with Ballet Rambert’s production “Cruel garden” performed throughout the UK and Europe. In the ‘80’s I produced five albums of original songs, performing them worldwide. In the ‘90’s I wrote and performed in the dance drama “About Time”, and the musical play “Mrs Columbus Speaks Out”, touring them widely throughout the UK and Ireland. I was Musical Director for Banner Theatre and Telling Tales Theatre Co, and composed the music for Conundrum Dance Company’s “Women Unbound”. I was tutor at Lumb Bank and ran workshops at several British universities. 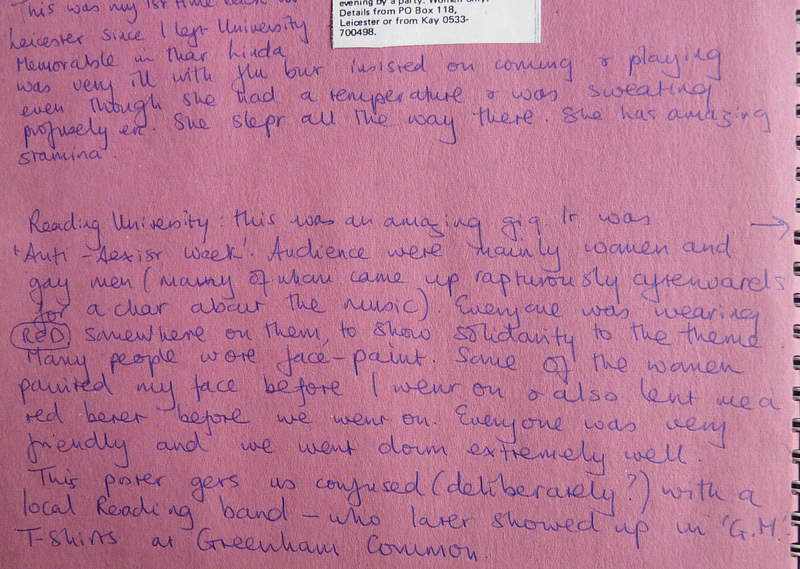 In 2000-2007 I gave concerts of my work at Morley College and other theatre venues; I composed the music for an oral history exhibition for Hounslow Community Services and was commissioned by The London Borough of Enfield to compose music based on Shakespeare’s Macbeth to be used throughout schools in Enfield. I composed and recorded the music for the Creative Partnerships’ project ‘Joseph’s Story’ and for 9 creative dance/drama projects under the umbrella of “Dancing Stories” used in Primary Schools in North London and Hertfordshire. We hope to post information about Martha Lewis and Eve Polycarpou, (previously known as Donna & Kebab and Donna & kbb in their incarnation as award-winning British Born Greek-Cypriot music/comedy duo) here soon! 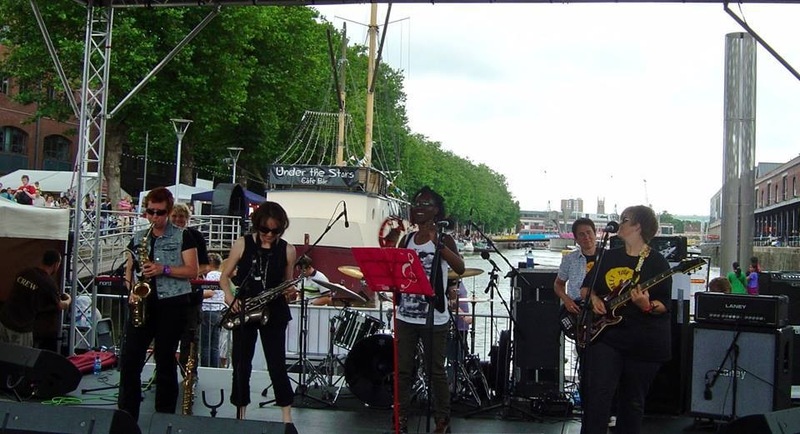 Meet Your Feet is an eclectic 9-piece all women band from Bristol playing original music with latin, jazz and soul influences. The songs are dynamic and have tight harmonies, catchy sax riffs, infectious percussion and lyrics that reflect the 80s drive for an environmentally friendly planet. 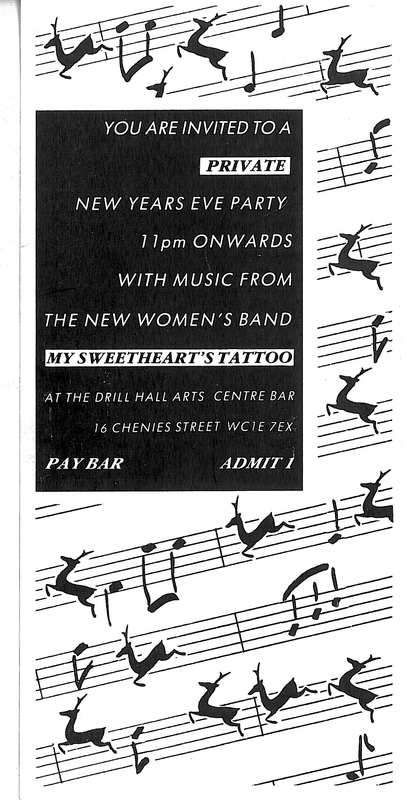 Formed in 1988 as a result of three of the women getting together to start a women’s music workshop, Meet Your Feet played its first gig in June 1988, when asked to get a set together for a Benefit Gig against section 28. 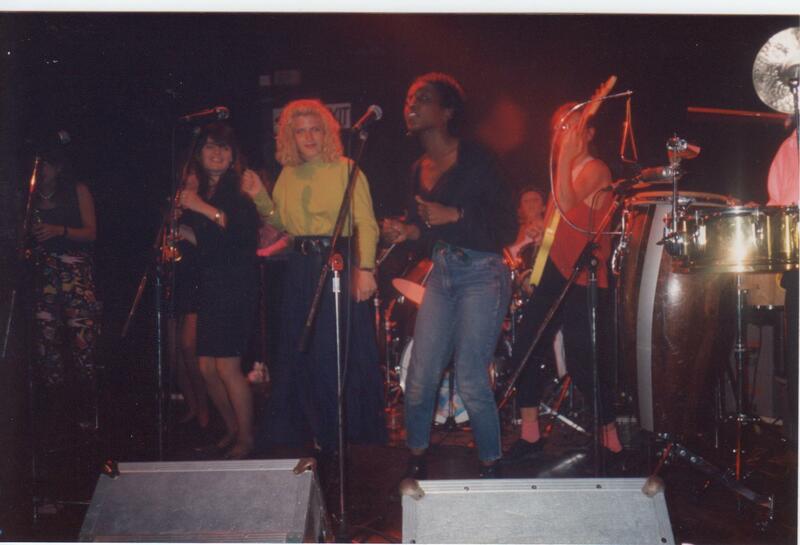 This gig was so successful that the band decided to stay together and gradually the original line-up of the early years of the band evolved: Carol Thomas, vocals; Diana Milstein, founder member, bass and lyricist; Diggy, percussion; Heie Gelhaus, founder member, keyboards and songwriter; Jayne Chard, manager; Julie Lockhart, vocals; Karen Keen, sax; Sue Hewitt, founder member, drums and songwriter; Vicki Burke, sax. 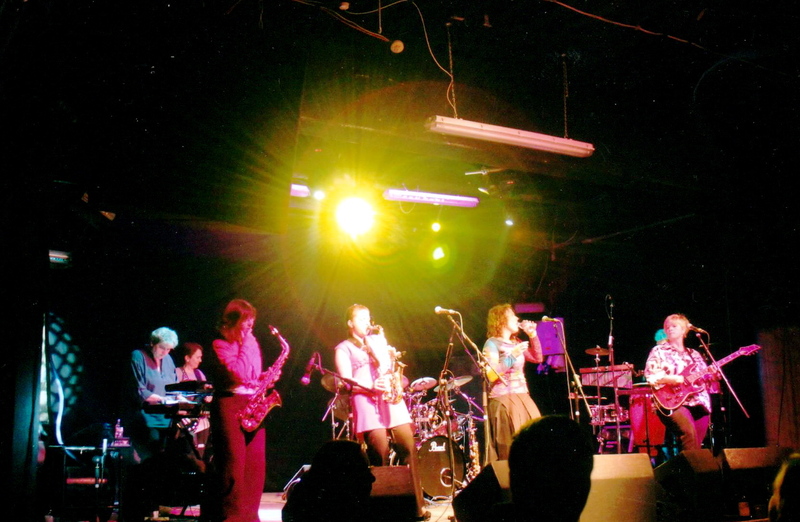 During the 80s, Meet Your Feet had a lot of success as a live band and as well as gigging all over Britain, they played also at all the prestigious festivals like WOMAD and Glastonbury. Meet Your Feet did several European tours. 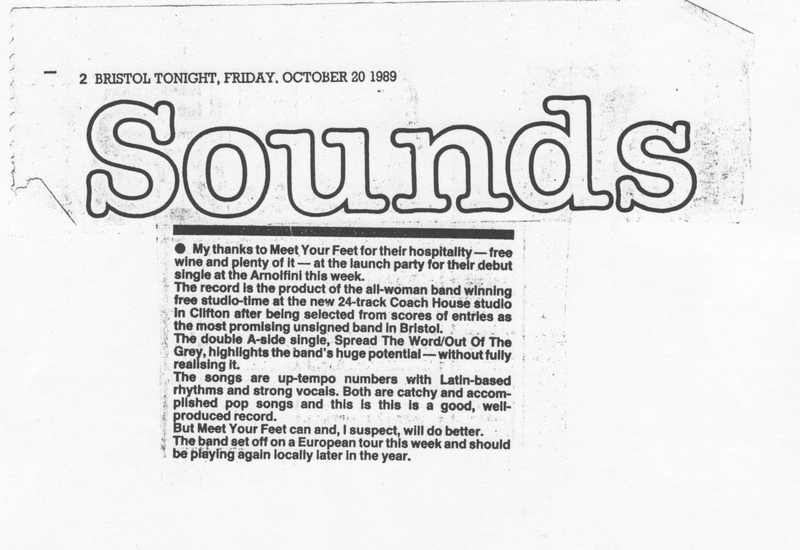 In 1989 Meet Your Feet was voted Bristol’s top band by Bristol’s Venue magazine readers. 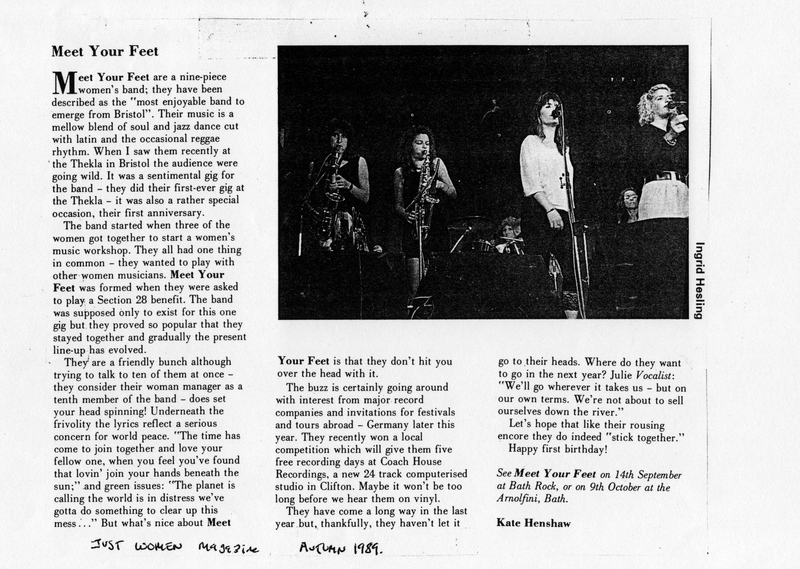 The band was featured on HTV and BBC TV and was also interviewed by Jenni Murray on the BBC Radio 4 programme “Women’s Hour”. 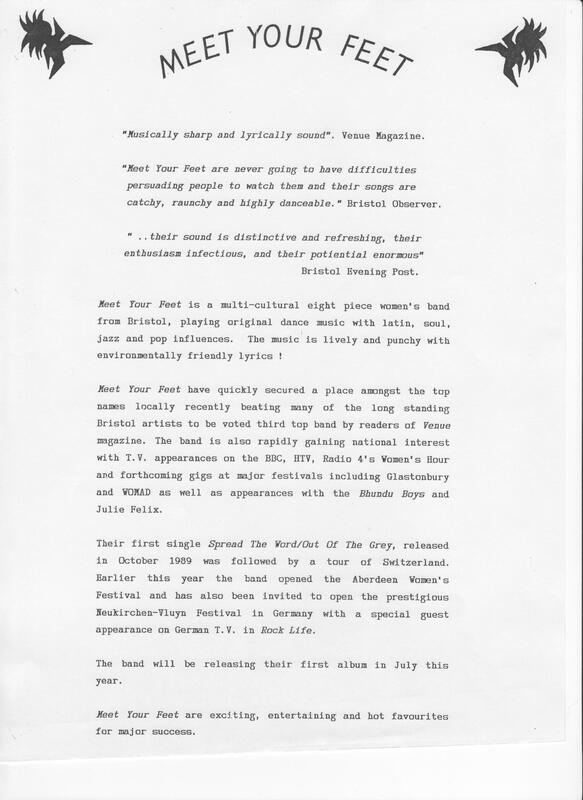 In 1989 they released their first double A-side single (“Spread the Word” and “Out of the Grey”) which they recorded after winning a competition as Bristol’s most promising new acts. 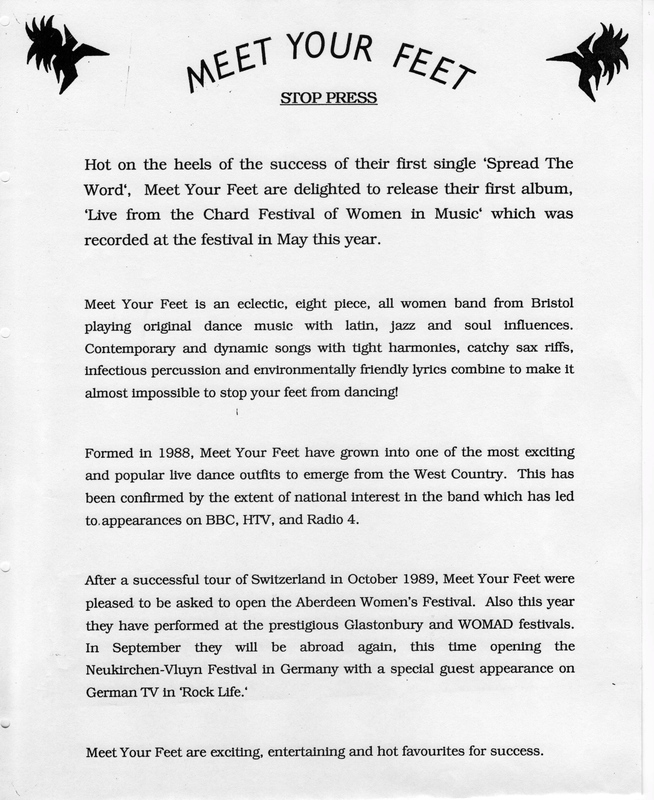 In 1990 they released their live album (“Meet Your Feet – Live at Chard”) recorded at the first Women’s Music Festival in Chard, Somerset. 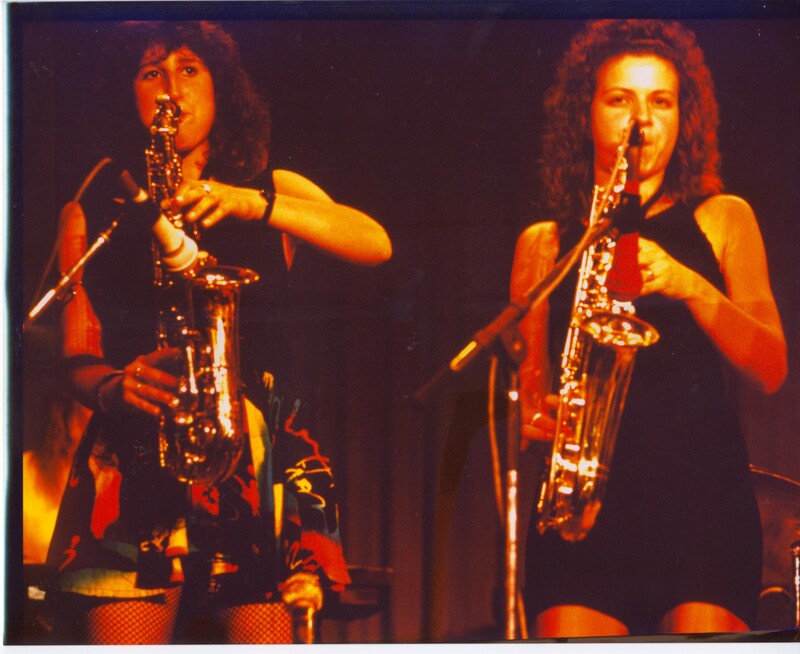 In early 1992 the group disbanded as it became harder and harder to find new women to join the band as others were leaving due to other life commitments and events. In 2010 Meet Your Feet reformed and has been gigging since. The latest line-up as a 9-piece is Bashema, vocals; Fanny Barratt, bass: Heie Gelhaus, founder member, keyboards and songwriter; Jos Wood, sax; Louise Cox, percussion; Norma Daykin, sax; Romilly Gibbs, sax; Sue Hewitt, founder member, drums and songwriter; Tina Holmes, guitar and vocals. In 2013 Meet Your Feet joined forces with Jelli Records and is expecting to release an EP later in 2013. I’d moved to Bristol in 1984 with drummer Sue Hewitt. I’d given up my theatre directing job in London to do a postgraduate film course at the University of Bristol. A few years later I’d started my own film production company and Sue had got together with Heie Gelhaus and Di Milstein – Meet Your Feet was born. It was 1988. The band had started out by doing some benefit gigs but it soon became apparent that they were going to be a well-loved Bristol band. After an early gig at the Thekla in Bristol, Di was talking to a man who seemed to be wanting a lot of favours. I caught her eye, and unseen by the man, made a gesture which indicated “What about the money”? To my surprise Di, without hesitation turned and said “Talk to our Manager” and looked directly at me. So, that’s how it all began. I never expected to find myself as the manager of a band. I quickly learnt all the technical jargon and how to listen to the mix in the sound check and explain to the sound engineer what kind of sound we were looking for. We played a lot of gigs in and around Bristol and the South West. The problem for me as a Manager was trying to get anywhere near a decent fee as there were nine musicians in the band. Somehow we always got by. I managed to get us two TV appearances on the local HTV’s Saturday Night Live, this really boosted our audiences for live gigs. I had also produced a music video of Dance Your Shoes Off which we used for our marketing. Soon we will looking further afield than the UK. With the release of our single we decided to go on tour, which meant investing in our own van. ’Cilla” looked like an old 1930s bus and we kitted her out on the inside so that the table also doubled as a very large bed. We all slept in the van and the kit was stored underneath the beds. I remember once being in the car park, somewhere in Europe, and the look of total surprise on the face of an innocent bystander as one by one all ten of us traipsed out of the van. It was like the tardis. It was always Heie and myself who drove. Both of us are scared of heights and the very high bridges in Switzerland were quite a challenge! Perhaps one of my fondest memories though is driving back, in the rain from France. Heie was having a rest in the back and lead singer Jules was in the front passenger seat. We passed what appeared to be a man waving in the rain and Jules said what a terrible job that was. It wasn’t a man at all but a mannequin! A little further on as we approached a bridge, which clearly had a 3 ton limit sign on it, I called back to Heie “How heavy are we?” “About 8 tons” came the reply; it was too late, we were already on the bridge. Lots of screaming ensued but we made it to the other side. Heie was many times our saviour. Cilla could be quite temperamental and it was only Heie’s knowledge of mechanics, and an incredible ability with a hammer, that saved us more than once from missing a gig! Back in the UK the bands popularity continued even though some of our line-up changed. Besides the usual gigs we also appeared at Glastonbury and Womad. 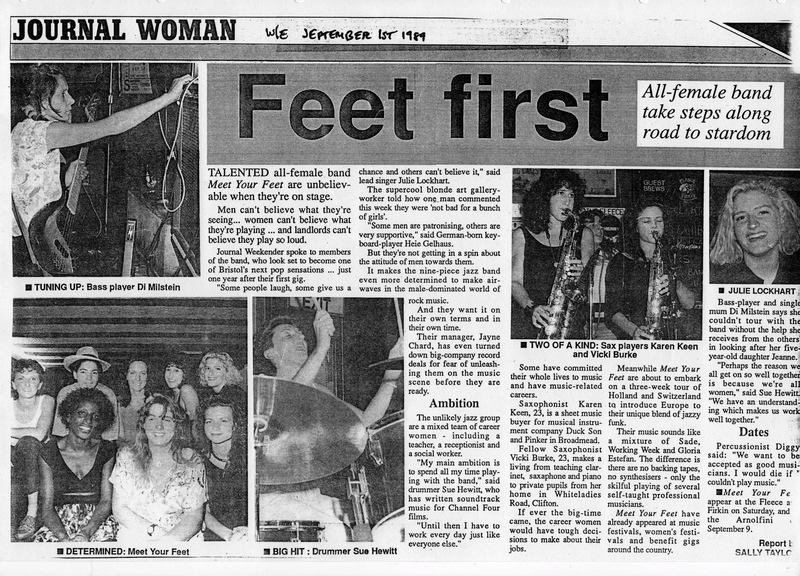 One of the highlights for me is when we played the first Chard Festival of Women in Music; the band were playing and I was also making a documentary for HTV about the Festival. This could be the first and last time that my two jobs would actually coincide. 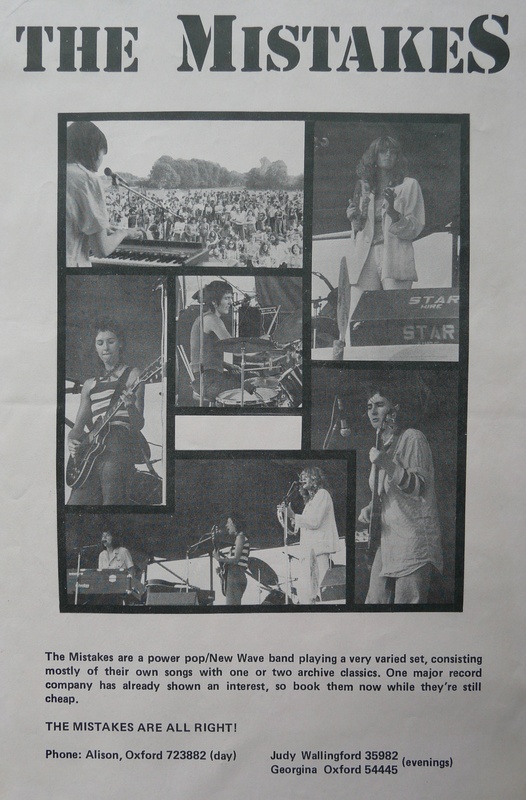 Ali West, keyboards, vocals; George Clarke, bass, vocals; Judy Parsons, drums, vocals (1978-80); Linda Gardner, drums, vocals (1980-1981); Mavis Bayton, vocals, guitar; Penny Wood, vocals, guitar, keyboards; Jill Posener, 6th/ non-playing Mistake. 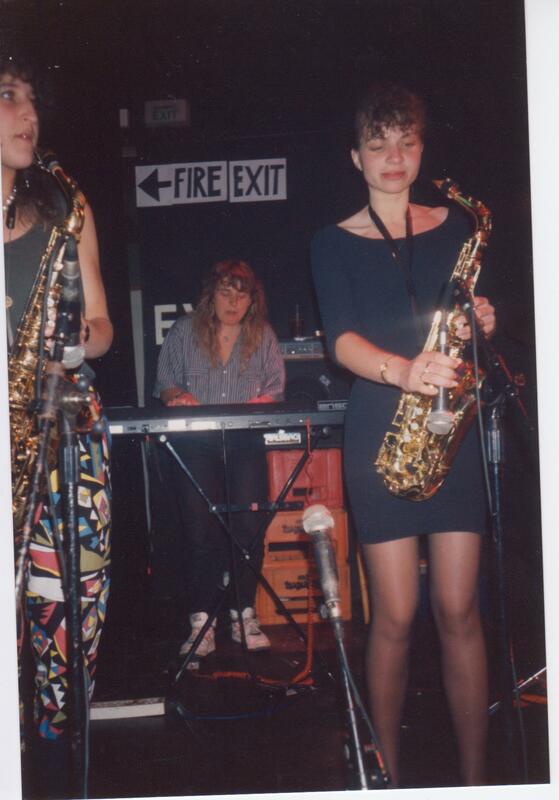 The Mistakes were a feminist pop-rock 5-piece band from Oxford. They were formed after George put an advert in the local newspaper, The Backstreet Bugle, for women to form a band after everyone expressed that they were fed up with dancing to sexist male music at the monthly lesbian disco. 6 weeks after meeting they played their first gig. They performed a few covers, such as My Girl, In The Midnight Hour and Green Onions, and original material created collectively from their different musical influences including Crystal Clear, Rose Tinted Specs and I Don’t Know What To Do About It. The Mistakes were influenced by a wide range of music including 50s/ 60s music and Boogie Woogie (Penny), political folk (Mavis) and Classical and Pop/ Rpck (Ali), Punk, Reggae, African and 60s music (George) and Judy had a wide range of musical tastes and technical know-how. She ran a rock PA hire company with her husband Jim who acted as sound engineer at the larger mixed gigs and festivals. Mistakes bassist George Clarke talks about recording with band. The Mistakes decided at the beginning to have an open policy for gigs, making themselves open to many benefits to the different political campaigns the group supported. 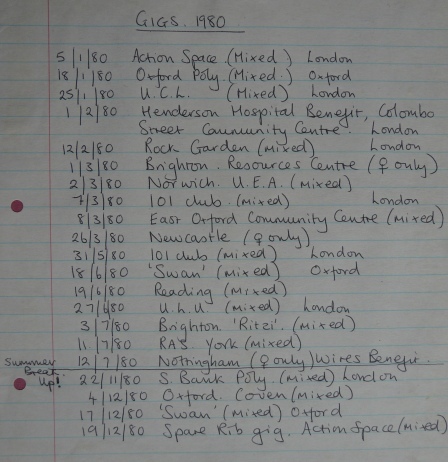 These included feminist gigs, CND (including a large gig at Greenham Common), Undercurrents, Anti-Nazi gigs, Rock Against Racism. 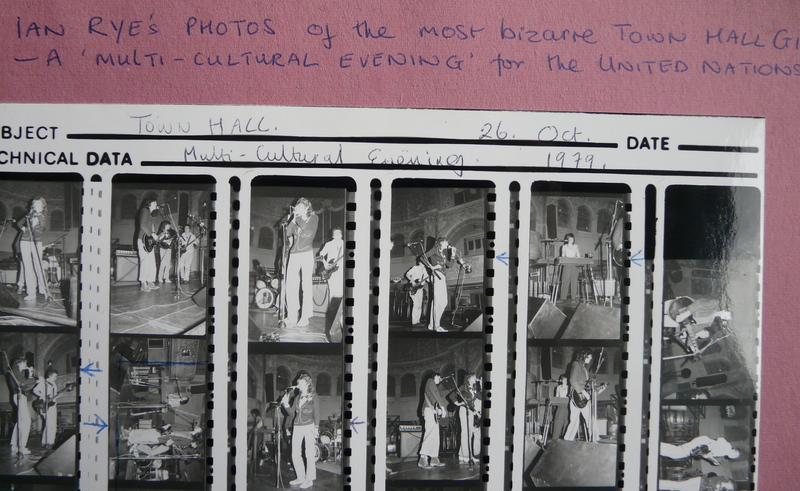 They also played local pubs and mainstream clubs in London like the 101, Rock Garden, the ICA and Dingwalls. 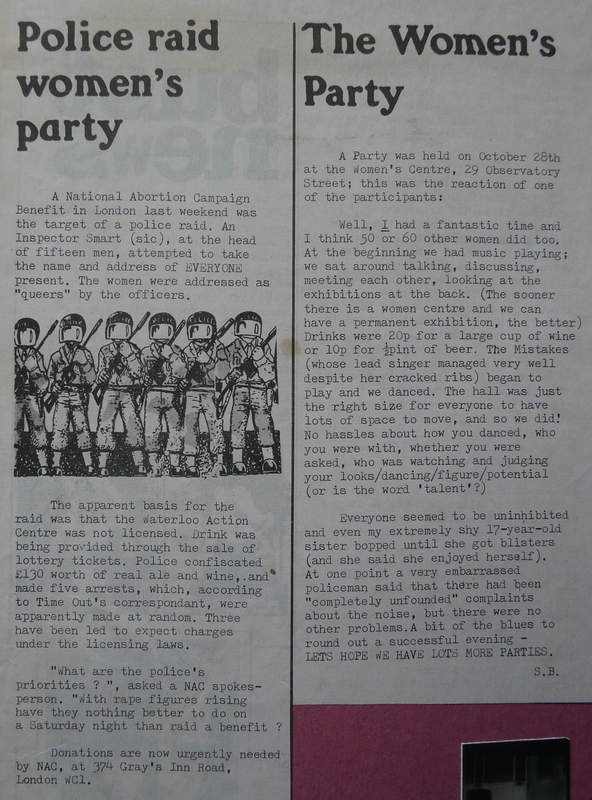 The Mistakes played a large number of women-only gigs including Spare Rib parties, Bisexual conferences and the Women in Manual Trade conference in Nottingham (which was disrupted by taking place in the same venue as a massive punch-up between England and Scotland supporters!) 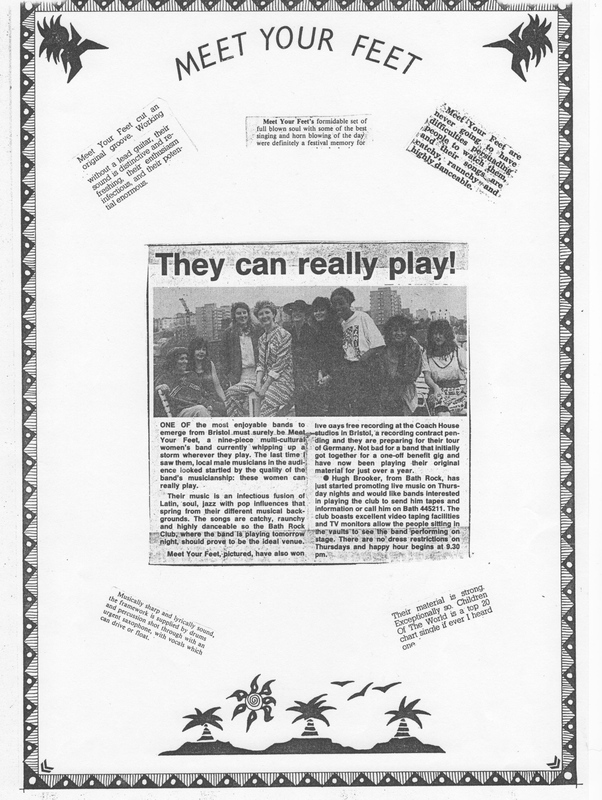 Alongside Newcastle band Friggin’ Little Bits, they appeared on a TV documentary about young lesbians called Veronica 4 Rose (1983), made by Melanie Chait. Here they performed the songs My Girl and That’s the Way the Cookie Crumbles filmed live at the Spare Rib Tenth Anniversary Party. 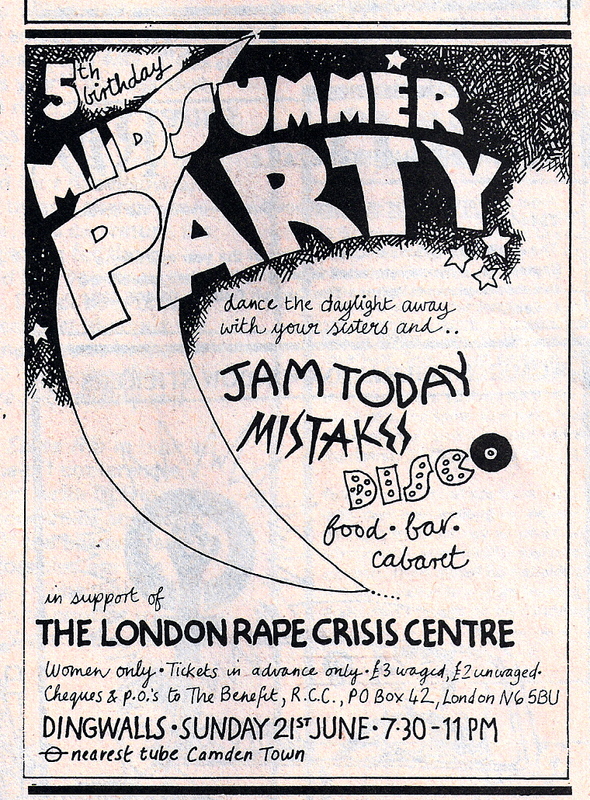 During their career The Mistakes played with acts such as Delta 5, Poison Girls, Alix Dobkin, Girlschool, Aswad and Jam Today. 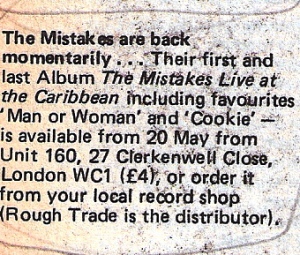 The Mistakes were signed in 1979 by Oval Records that was run by Charlie Gillett. Oval released the Mistakes from their contract because they despaired of the longer time taken to work collectively (Oval then decided to fund the Thompson Twins instead). In 1980 after Jill Posener joined the band as the 6th, non-playing Mistake (or manager), they got signed to Deviant Records who then via Twist and Shout Records released the 7” Radiation b/w 16 Pins recorded at Blackwing Studios, Lambeth during the weekend of the Iranian Embassy siege. 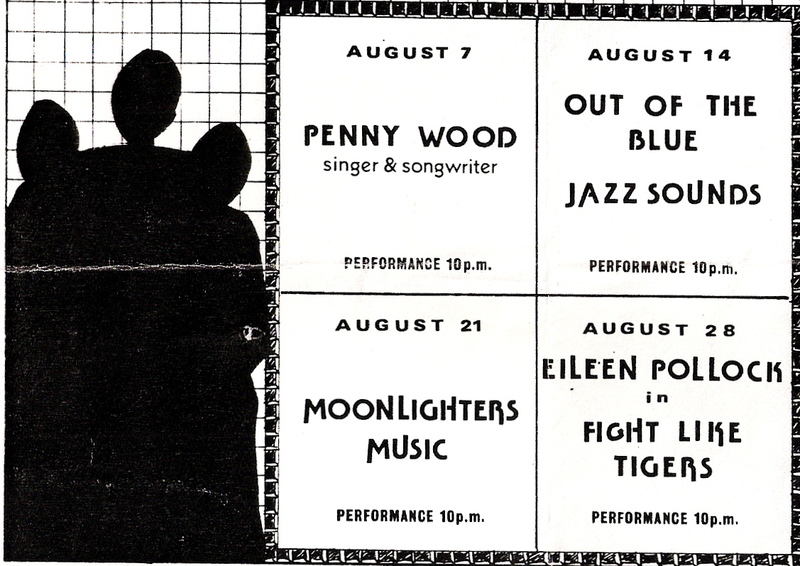 During this time of upheaval Penny decided to go solo with a band called The Dots. 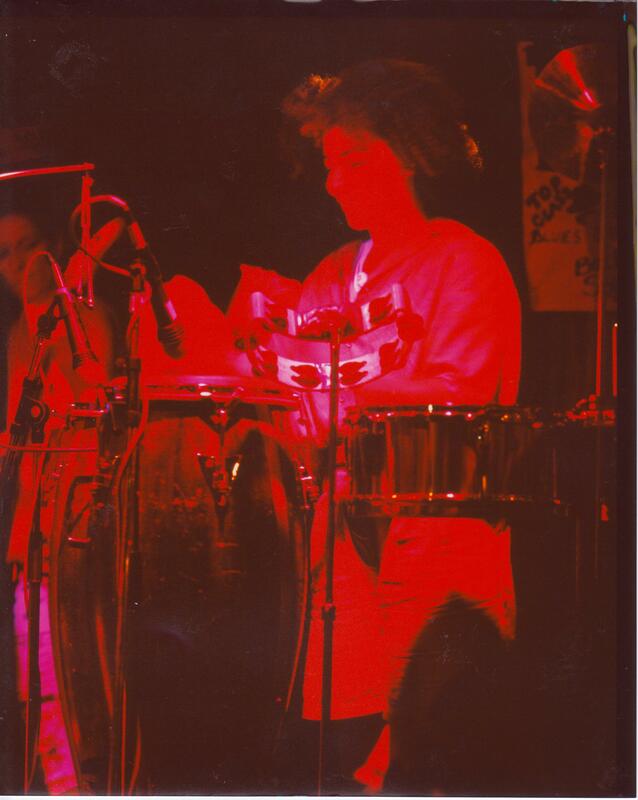 The Mistakes then advertised for a replacement drummer, holding auditions in London and were joined by Linda Gardner from Hackney. The Mistakes performed for just over a year as a four piece. 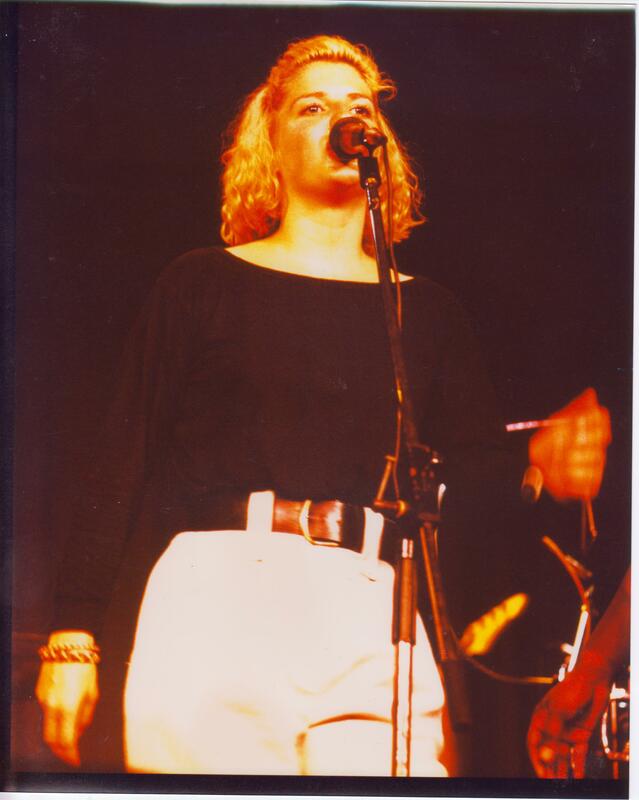 At this time they played a mini tour in Italy where they were rejoined by Penny who, at a memorable gig, crowd surfed into the Italian feminists and wasn’t seen until the next day where a panic ensued at the airport as she didn’t have her passport. 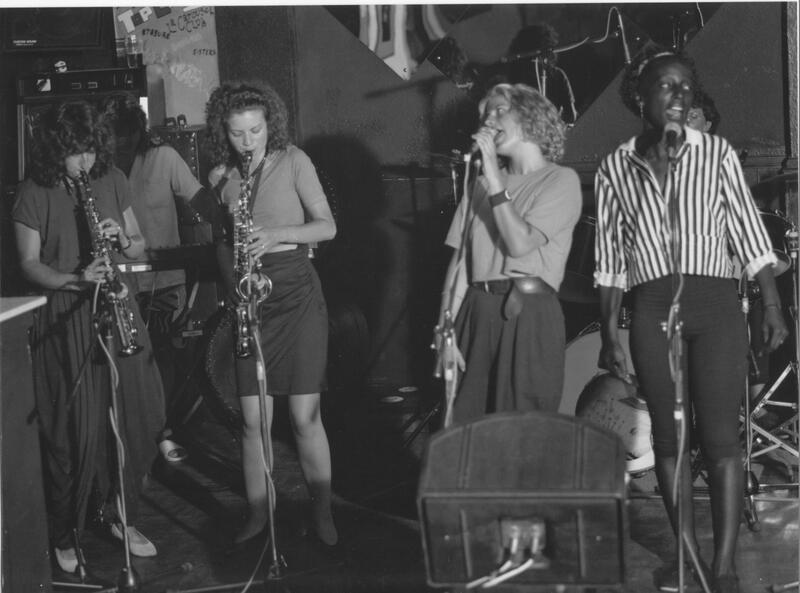 Later George decided to leave to follow her Dub Reggae urges and the band decided to call it a day, recording a live LP at the Caribbean Sunshine Club, Oxford, September 26th, 1981, as a farewell gig. 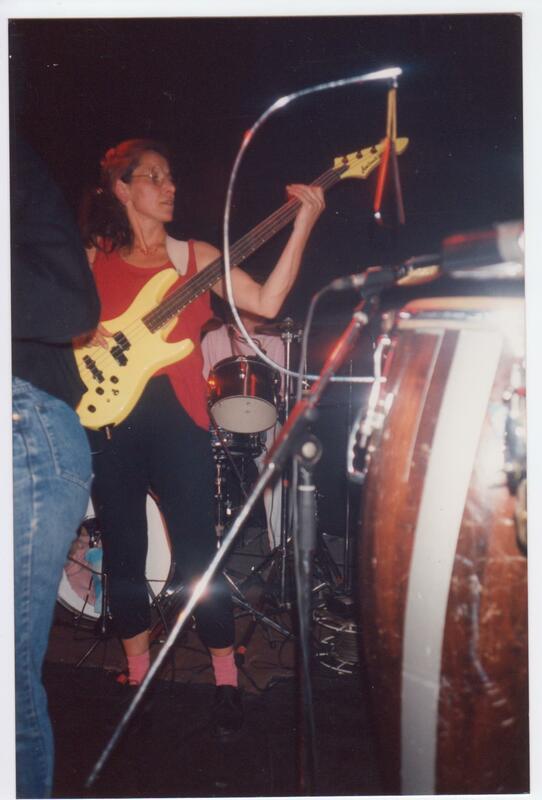 Later Mavis became so concerned about why so few women were playing in bands that she started doing research whilst still in the band and later wrote the book Frock Rock (OUP, 1998), a detailed study about women in the music industry. After The Mistakes Ali left Oxford and got into choral music. She now writes her own choral music as well as directing a choir. 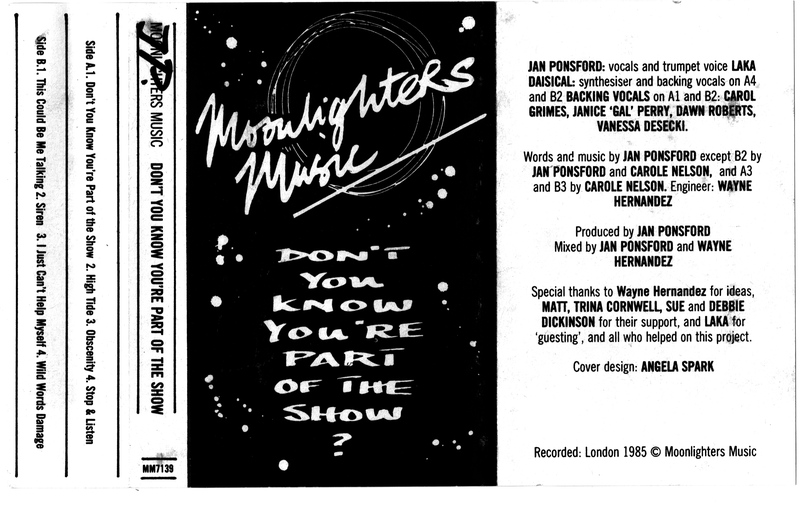 Their album ‘Don’t You Know You’re Part Of The Show?’ was distributed by Ladyslipper, US feminist record distributors. Audrey Swinburne, guitar/lead vocals; Jackie Badger, bass/vocals; Jackie Crew, drums/vocals; Lesley Sly, keyboards/lead vocals. Listen to them here: this track was recorded in 1975, and the film made in 2017 for a talk on women who played progressive rock in the 70s. The group released their album ‘Lady Madonna’ in 1975. During their time together Mother Superior regularly toured Europe and the UK, appeared on BBCTV and released an album ‘Lady Madonna’ in 1975. 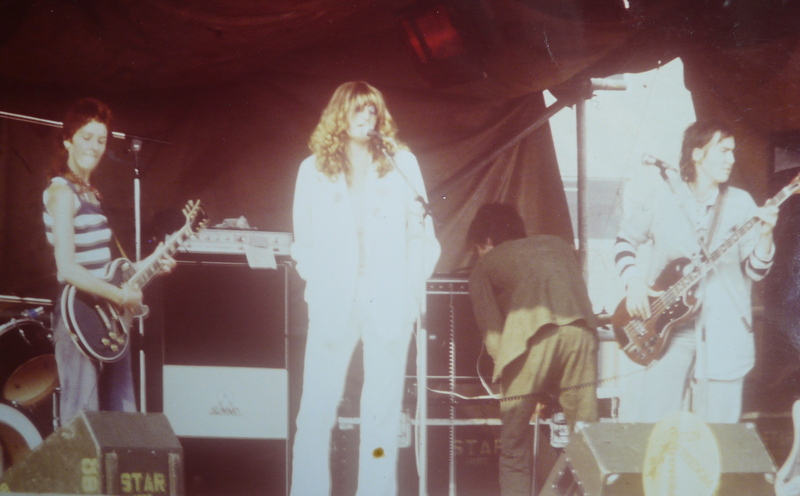 From August 1976 they were joined by Kate Buddeke, lead vocals and Janis Sharp, guitar and continued with mixed line-ups until December 1977. Mother Superior upsets Cliff Richard’s religious sensibilities!